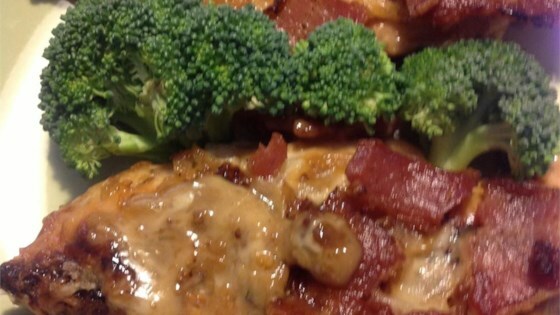 "Chicken breasts browned and baked with soy, Parmesan cheese and a bacon/onion mixture. Simply delicious!" Heat a large skillet to medium heat and fry bacon until crisp. Drain and pat dry with paper towels; set aside. In the same skillet, saute onion in bacon fat until tender. Add to bacon and set aside. In a separate large skillet, heat oil over medium high heat and brown chicken breasts. Place browned chicken in a lightly greased 9x13 inch baking dish; pour stir-fry sauce over chicken, then spoon salad dressing onto each breast. Sprinkle with cheese, and top with the bacon mixture. Bake in preheated oven for 30 minutes or until chicken is cooked through and juices run clear. See how to make a creamy, piquant chicken dish.